I made the batch into mini muffins and took some to the neighbors and lets just say the whole batch of mini muffins (approximately 56 of them) all got eaten by the neighbors and I in less than 24 hours. 1. Preheat oven to 350 degrees Fahrenheit. Grease muffin pan or insert liners into pan. 2. In a large bowl, mix together flour, sugar, baking soda, cinnamon, and salt. Stir in the carrot, raisins, zucchini, apple, and pecans. 3. In a separate bowl, beat together eggs, oil, and vanilla. Stir egg mixture into the carrot/flour mixture until moistened. 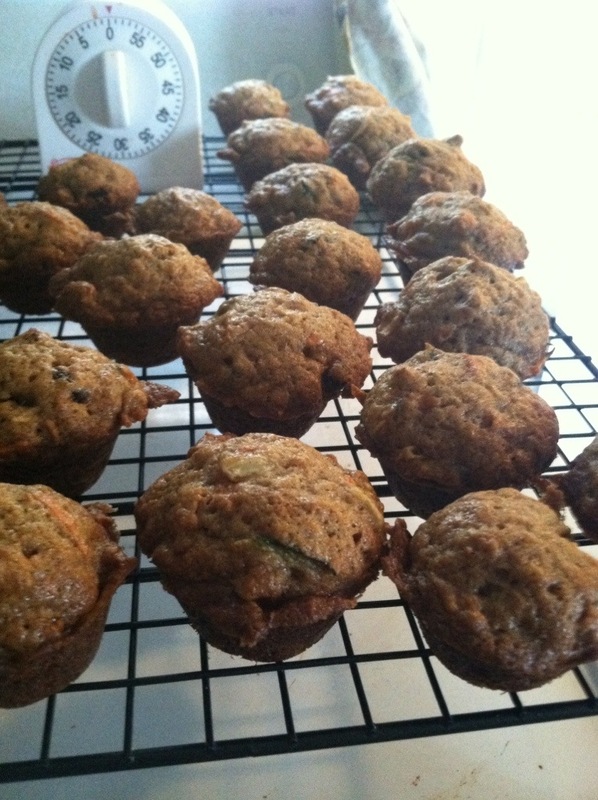 Scoop batter into prepared muffin cups. 4. Bake in preheated oven for 20 minutes, until a toothpick inserted into the middle of a muffin comes out clean. Now for mini muffins, it only took about 15 minutes to bake at the same temperature of 350 degrees. If you are a intermediate baker, you will be able to tell when they are ready by them having all the same color. If they are a different color in the middle than the outside, the muffins aren’t done and need a few more minutes. Also if making mini muffins, make sure the shredded ingredients are also chopped a bit finer so each muffin receives all the ingredients for a uniform wondrous taste. Makes approximately 4 1/2 dozen mini muffins. So yummy!